I took a really long time to get into this book. Until part two I could probably have just put it down and not even been curious as to the ending. I'm not sure what exactly was wrong with it, especially as the last book I read from this author was a lot better. But I was never taken in by the characters or the plot enough. It took me longer than I usually take to finish this book. This book follows on from The King's Daughter but isn't strictly a sequel, it can be read as a stand-alone story. Instead of continuing to follow the fortunes of Elizabeth Stuart, it focuses on the fate of Lucy Russell, the daughter of Elizabeth's guardian and Chief Lady of Queen Anne of Denmark introduced in the first book. Fate hasn't been kind to Lucy and she has fallen on hard times since the death of the Queen. Her only chance to shine at court again is to get Elizabeth and her husband to return to England and set up court with her father. But for political reasons, King James doesn't want her back in England, nor will he send armies to protect his daughter who is now in exile in the Hague. So Lucy takes it upon herself to orchestrate Elizabeth's return. Although Lucy wants Elizabeth back for her own personal reasons there are others who would like to see the return of the First Daughter of England for darker reasons and Lucy becomes embroiled in their plotting...This book has it all: deceit, murder, treason, secret affairs...so why didn't I enjoy it as much as 'The King's Daughter'? It's hard to say - the story is interesting and the subject new to me (although Lucy was a major historical figure at the time). It is well written and the detail impressive. I think the biggest problem was probably that I was expecting more of 'The King's Daughter'. I ended up comparing Lucy and Elizabeth having read both books back to back. Elizabeth struck me as being innocent and pragmatic, whereas Lucy came across as selfish and sentimental. Far too much time was spent on the details of Lucy's affair with John Donne, from the blurb I had expected more cloak-and-dagger. Also, I felt the pace was slower. I think that had I read this book on its own rather than straight after 'The King's Daughter' it would have fared better but as it was I was expecting something else. A future reread may well earn this book an extra star. I love historical fiction, particularly that set in Britain, and so was keen to read this novel, especially when I discovered that the author worked with the Royal Shakespeare Company for many years – what a wonderful job, and such a chance to immerse oneself in period stories.The novel is beautifully written and expertly researched. I particularly enjoyed reading the historical information included at the end of the book, on characters, settings and events. I found myself entirely relaxed that the author knew her facts inside out, and had crafted them carefully into an engaging, realistic tale. Lucy is a heroine whom it is impossible not to like: strong, courageous, intelligent and altogether human in her inner struggles. A vein of tragic grief provides a poignant undercurrent for the book, set up in the very first pages as Lucy contemplates suicide, and the other emotional pull which I found powerful is Lucy’s fierce loyalty to her queen, and in many ways surrogate daughter, Elizabeth Stuart, The Winter Queen.There is love in this story – between Lucy and the poet John Donne – but I’m not sure I would class this as romantic historical fiction because to me the love element was not a major part of the story. Still, it echoes through.For me, the key strength of the book is the care that the author takes to let us into Lucy’s thoughts and feelings. There is plenty of pace, but also plenty of attention given to how Lucy perceives events. I enjoy books that contain this emotional dimension, and I think that’s what makes this book stand out as memorable. The Noble Assassin is the story of Lucy Russell, Countess of Bedford; a once prominent figure at court but now suffering the effects of poverty. Stuck in an unhappy marriage to a miserly and mean man, Lucy jumps at the chance to regain favour at court, but even the best-laid plans can go horribly wrong. I can't really decide whether I reallyenjoyedthis book or not. The story itself was interesting, switching between current events and Lucy's past experiences which may have affected the current moment, which was effective but occasionally a little confusing.Lucy is a likeable enough heroine, with definite flaws and she is all too human. Characterisation is done very well, as are the relationships between characters.While the plot was good, there were times when I felt a little bogged down and just wanted the book be finished - however I was never tempted to give up on it. The prose is well written and there is some beautiful period poetry in there; and the ending is worth sticking with it - exciting and beautiful in turns. However I was never gripped by the story, and for that reason I'm only giving it 3 stars - I liked it, but I don't know that I would read it again. That said, I am still interested in reading some of Ms Dickason's other works, as she evidently knows her stuff. I came to this book with high hopes having loved all the previous ones by Christa Dickinson. Somehow this one left me cold. The story of Lucy Countess of Bedford who is out of favour and wants to be back in to make her fortune did not engage me.On reflection i think that this is brave attempt by the author as the heroine was not a sympathetic one. But in order to make her more appealing there was too much emphasis on how awful her life had been which historically apt when told in the first person made her a difficult character to warm to. I felt that more about Elizabeth of Bohemia or the Lucy of early scenes who was racing to court to meet the new queen would have hooked me moreThis book left me a bit confused or not caring enough about the characters to care about what happened to them.A great study of intrigue and plots but did not engage me. 2015 Book Awards: Worst Read Runner-Up(information about this award is available on my profile)Reading challenge 2015: A book with bad reviews (possibly)I would give it 2.5 if I could, because the ending was quite interesting. Other than that it was quite a boring and slow read. The Countess of Bedford is a very interesting person, but she is written in a very odd way that also causes everyone else to be looked at in a strange light. The only really interesting bits were the interactions between her and her husband and John Donne. The flashbacks were also not perfectly placed out, which caused some confusion while reading. 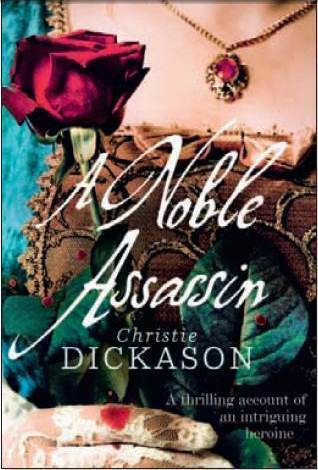 Christie Dickason has carved out a niche for herself writing historical novels set during the Stuart period, which is just as bloody, romantic, tragic and interesting as the more popular Tudor period. I’ve always loved the Stuart period, and so I’ve been reading my way through all of her books, and loving every one of them. The Noble Assassin has as its heroine the beautiful and clever Lucy Russell, Countess of Bedford, a real historical figure, with the poet John Donne taking the role of romantic hero. Fabulous! I loved it. Not my cup of tea. Honestly, I found the storyline boring, and the protagonist thoroughly unlikeable. The story was meant to follow on from an earlier book by the author, The King's Daughter, but there were inconsistencies which just drove me mad. The writing style felt like the author was trying to reel off lots of information in a hurry, and the tenses were all over the place. There was something about the way Lucy's internal monologue was written that reminded me of Philippa Gregory at her worst (think Mary QoS in The Other Queen).Sorry, just didn't like this one. Overall, not bad. As with other Christie Dickason books, a bit slow to get started, and a bit muddly with all the characters. But at least (unlike Gregory) she doesn't repeat over and over again who the characters are.Only really grabbed me with wanting to know what was going to happen at the end. Otherwise very much a take-it-or-leave-it kind of book, that I'm glad I picked up on a "further discounted" sale, and I dont think I'll bother reading it again. Enjoyed the first half, thoroughly bored by the rest. Well researched a good historical novel based arond James1 reign. I found it hard to get into this book. It switched time and character quite a bit at the beginning. Once I got into it it got better but still it wasn't the most enjoyable book I've read.